Here's an activity box to introduce your child to counting, numbers, shapes, and so on: Creative Mathematician! When was the last time your little Ramanujan or Shakuntala Devi enjoyed learning numbers and shapes without fear? 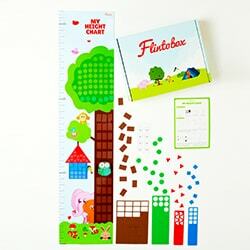 Flintobox gives you just the right equation to keep the arithmetic monster at bay! 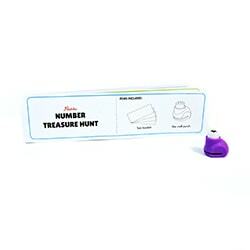 Activities featuring shapes, numbers, treasure hunts, and a board game! Your house turns into the base of an expedition camp as your child runs about completing tasks. Adds fun factor to counting! Your child designs the height chart with colourful shape stickers and learns to measure their height! Your child creates many magical patterns with 7 simple shapes. 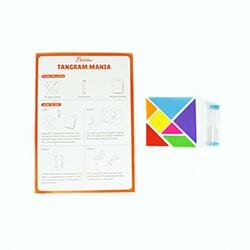 A Chinese geometric puzzle that multiplies creativity with analytical skills! Jollyville welcomes your child to its renowned market! They reap a lot more than just buying, selling, and counting. 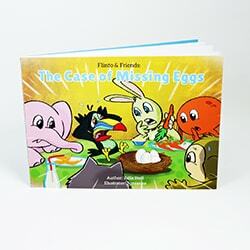 Flinto and friends go on a mathematical adventure where they deal with numbers! 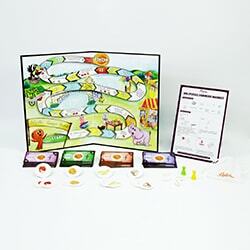 Two eggs go missing. Where could they be?